Let your taste buds see why Kimono's was voted Best Japanese Restaurant in the Winston Salem area! At Kimono's, our focus is Fast, Healthy, Filling and Delicious! 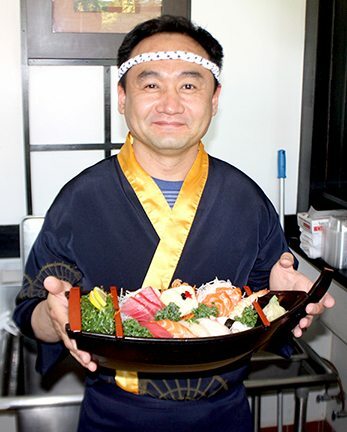 Since 2001, we've aimed to be your favorite Japanese restaurant by serving great food made from fresh ingredients. Our expansive sushi menu is freshly made when you order. We are a locally grown restaurant that truly appreciates each customer. Our family and casual style restaurant complements every customer. Enjoy our spicy hibachi or try our delicious Teriyaki chicken! We also offer a kids menu to keep the whole family satisfied! Join us on our patio for al fresco dining! And to complement your meal, we offer a full beer and wine menu. We invite you to be our guest at Kimonos today! We would love to see you at one of our three locations: Country Club, Summit Square, and Welcome. And for birthdays and more, we offer gift cards! Always good food, and very polite people. Many sushi places I’ve been to seem to have old tuna in their sushi a lot, however this place always tastes new. I’ve yet to have a bad experience there. Very friendly employees, nice and clean restaurant, and fast with orders. The Winston-Salem roll is one of the best sushi in the restaurant. I love this place. The atmosphere is relaxing, I could hang out for hours. Awesome food, great service and the prices aren’t to bad on the wallet. Always enjoy coming here. One of my favorite places to eat. I absolutely love Kimono! Not only was our takeout ready in 10min, the sushi was fresh and full of flavor. I had California rolls and also the Rainbow Rolls and it was truly an experience in my mouth that was perfectly balanced in flavor, texture, fresh and light. I can’t wait to return again soon because just talking now about it now makes me crave it again! Love this place the sushi is great the service is always wonderful. We live 5 to 6 minutes away and this is our favorite sushi place. Miso is amazing! Even got a salad on the house. From KC on business. This place was right behind the hotel. Highly recommend! Fast, Healthy, Filling and Delicious!